Established in 1997, the River North Residents Association is a 501(c)4 non-profit and non-political neighborhood advocacy association working to protect and enhance quality of life in River North. 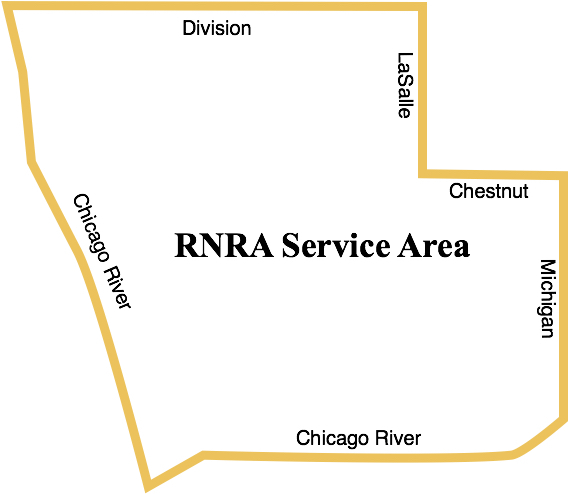 RNRA works closely with government representatives, public safety leaders, business owners, developers and other stakeholders to make River North Chicago’s premier neighborhood in which to live, work, play and shop. We value your support and encourage you to join the Association. We are an organization comprised of volunteer residents who work together on infrastructure improvements, public safety, parks and green space, co-existence with hospitality and tourism venues, real estate development, traffic management, homeowners association and property management support and more. Our annual Film Festival, children’s events and Taste of River North are enjoyed by thousands of River North residents and their families and friends. We value your support and welcome your feedback. All condominium associations, rental apartment buildings and individuals living in single family homes or town-homes within our service area are eligible for membership. Click the button below to complete our simple and secure application. Click here to download RNRA’s W9 form. Members are encouraged to attend events, participate in projects and activities and generally support and promote RNRA and community interests. Members are encouraged to advise RNRA leaders about important issues and opportunities to advance our mission or improve our services. We never share contact information with third parties for any reason without permission. In addition to the great feeling that you get from supporting one of Chicago’s premier neighborhood advocacy organizations, we encourage you to download RNRA’s one-of-a-kind “My River North” mobile app, which provides convenient access to River North news, events and resources, plus special deals from participating local businesses. Click here for details. Please feel free to contact our Executive Director at info@rnrachicago.org with any additional questions.